in the memorial game on September 15, 2001. Just four days after 9-11-2001. Deasey rushed for 146 yards on five carries. WILLIAMSPORT, Pa. - After a four-year hiatus, one of the fiercest rivalries in small college athletics will continue on Saturday, Sept. 6, as the Lycoming College football team will host Susquehanna University in the Stagg Hat Trophy game at David Person Field. The Warriors, who finished 7-3 in 2013, enter the game receiving votes in the D3football.com preseason poll and return a squad loaded with seven returning all-conference players, including All-American safety Tanner Troutman and all-region running back Craig Needhammer. The Crusaders, who are coming off a 1-9 campaign in 2013, are predicted to finish in ninth in the Centennial Conference preseason poll. The team is led by kicker Spencer Hotaling, a three-time first-team all-conference selection. • The Warriors and Crusaders have competed for the Stagg Hat Trophy since 1993. Lycoming holds a 12-5 lead in the trophy game series. • Senior Tanner Troutman is the first player in school history to earn back-to-back First Team Preseason All-American honors from D3football.com. • Senior Craig Needhammer needs 29 more rushing yards to become the fourth back in school history to post 2,500 in a career. • Needhammer is also three rushing touchdowns shy of the school's career record of 29 held by Tim Deasey (1998-01). • Senior Tyler Jenny needs 164 more yards of total offense to become the eighth player in school history to rack up 4,000 in a career. • The Warriors have won their last six games at David Person Field, the most since an eight-game stretch in 2007-08. With nine starters returning from a 2013 squad that averaged 26.5 points per game, the Warriors will look for continued improvement from an offense that already returns five all-conference performers. The Warrior offense will once again be led by senior captain running back Craig Needhammer, who finished second in the MAC in his first season as a starter with an average of 118.4 yards per game. For his efforts, which included tying a school record with 14 touchdowns scored, Needhammer was named to the D3football.com All-East Region Third Team. Giving the ball to Needhammer for the third straight year is senior Tyler Jenny, who was a second-team all-conference quarterback as a junior. Jenny holds the top pass efficiency rating (142.7) and completion percentage (62.6) in school history. In 2013, the Warriors were once again at the top of the conference in most defensive categories, leading the MAC in total defense (304.0), rushing defense (91.4) and points allowed (18.3). Although the Warriors lost four starters from that squad, one of the returners is a two-time preseason All-American safety in senior Tanner Troutman, who led the nation with 0.8 interceptions per game as a junior. Besides Troutman, the Warriors return significant experience on the defensive line, where seven players return, led by junior John Ciurlino, who had 3.5 sacks, and senior Braden Zeiner, who had seven tackles for loss, in 2013. At linebacker, the Warriors will need to replace two all-conference honorees from 2013, but return senior captain Kyle Sullivan, who finished second on the squad with 59 tackles. Like Lycoming, the Crusaders are stocked with nine returning starters from the 2013 squad, which finished 1-9 overall. The offense will be paced by junior kicker Spencer Hotaling and senior wide receiver Denzell Walker, who were both named USA College Football Preseason All-Americans. Hotaling is one of the best special teams players in the Centennial Conference, as he connected on 8-of-10 field goals and 25-of-27 in extra points in 2013. Walker was named to Second Team All-Centennial Conference in 2013 after leading the team in receptions (38), receiving yards (615) and touchdowns (5). Eight starters return on a defense that allowed 31.1 points and 404.9 yards of total defense per game for the Crusaders in 2013. The group will be led a corps of returning defensive backs, including seniors Steven Viegas, who posted 71 tackles and eight passes defended, and Cody Miller, who finished with 59 tackles, 5.5 for loss and led the team with 13 passes defended. Junior Tom McLoughlin made 50 stops and senior Ian Murray made 40 tackles in the backfield in 2013. Senior linebacker Mason Spangler will also be a force for the team after posting 31 tackles, 10.5 for loss, and junior Corey Litton also returns after notching 29 tackles in 2013. Senior Mike Statuti leads the returning lineman, as he made 23 tackles, including 1.5 tackles for loss, during his junior year. An actual bronzed fedora worn by the legendary Amos Alonzo Stagg Sr. when he coached at Susquehanna University, the Stagg Hat Trophy became the trophy in the square off between Lycoming College and Susquehanna in 1993 after it had been used for the winner of Susquehanna's home opener from 1960-78. 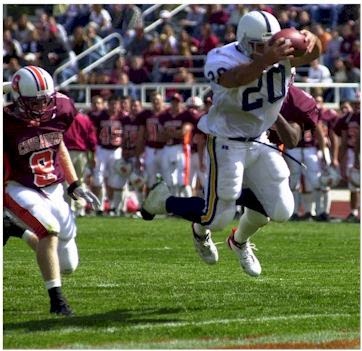 The Crusaders won the first three Stagg Hat Trophy games against the Warriors, but Lycoming has won 12 of the last 14. Senior Craig Needhammer enters his senior year within full view of several school records. The 5-7, 178-pounder needs just three more rushing touchdowns to tie the school record of 29 set by Tim Deasey (1998-01), while his 10 100-yard rushing games is five shy of the record of 15 set by Brian Thompson (1995-98). He is also 1,050 all-purpose yards shy of the school record of 4,474 set by Josh Kleinfelter from 2007-10. Dynamic, playmaking senior safety Tanner Troutman was named a First Team Preseason All-American by five organizations - D3football.com, The Sporting News, Lindy's College Football, Beyond Sports Network and the USA College Football Network. Troutman tied for the national lead in interceptions as a junior, finishing with eight in 10 games, helping him to a host of All-American accolades, including First Team D3football.com and Third Team Beyond Sports Network All-American honors. He was also named the D3football.com East Region Defensive Player of the Year. Lycoming topped the MAC Coaches' Preseason Poll for the second straight year. The Warriors, came in first in the poll with 77 points and five first-place votes, outpacing Delaware Valley, which finished second with 68 points. While the Lycoming football staff has always been long on experience, the 2014 coaching staff has plenty of long-time veterans, as a corps of four coaches have a combined 112 years of collegiate coaching experience. Head coach Mike Clark is entering his 21st year on a college sideline and quarterbacks coach Tim Landis is starting his 24th. Defensive coordinator Steve Wiser is beginning his 41st season and linebackers coach Mike Weber is entering his 26th. Both Wiser and Weber have only coached with the Warriors.